I’ve been under the weather all week, so haven’t had the energy to cook. Howard is convinced I have the H1N1 flu, but I say it’s just a cold. The symptoms listed on the CDC site are too vague to be convincing. I did stay home from work for two days. For those who know me, that gives you an idea of how sick I’m feel. I really felt like I needed some homemade chicken soup tonight. My usual stand-in when I don’t feel well is to order wonton soup from a local Chinese restaurant. I didn’t even feel like I could go pick that up. We picked up our CSA share last weekend, and the perishable vegetables really need to get cooked. Howard has made some delicious salads to take for lunch during the week, so the lettuce is gone, and we’ve made good progress on the radishes, carrots, and turnips. The pound of spinach told me what to do. This spinach tortellini soup has been a favorite in our house for years. It is restorative and filling without being heavy. I found some duck stock in the freezer and asked Howard to pick up fresh tortellini at Russo’s. 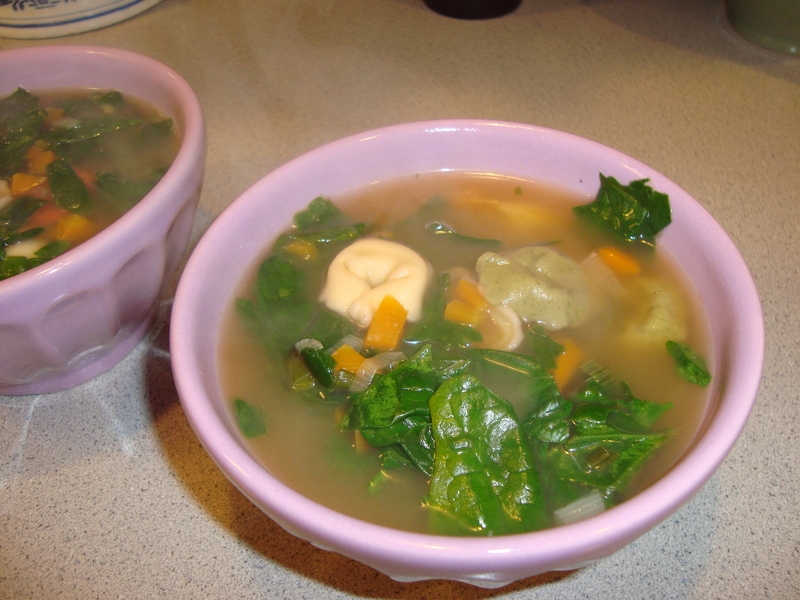 The hardest part was cleaning the spinach, so over all, this soup is really easy to throw together. Melt the butter in a large soup pot. Saute the carrots, scallions, and garlic until the carrots start to soften, about 3 minutes. Add the broth. Cover. Bring to a boil. Add tortellini, and simmer until cooked (about 8-12 minutes). Stir in the spinach, and cook, uncovered, until the spinach wilts. The leftovers will not look as nice as when it’s first made. The spinach will discolor, and the tortellini will swell up. But it will still taste good.